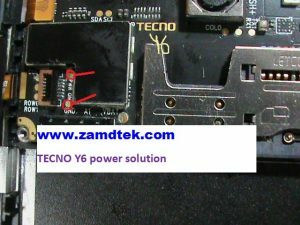 Today we are going to show you how to fix Tecno Y6 power solution. Most of the time due to careless your phone may drop on a liquid not knowing. The liquid becomes a big problem to your phone as it will start reacting with the tiny ics components in the panel. Which may result in phone not booting on coming on. Check the panel for water damage. Clean the panel off dirt. Check for (according to the image below) for GND and PWR gold points short the two points. 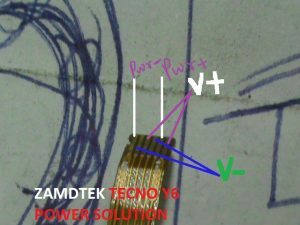 Gently remove the the power-volume-button flex as indicated in the diagram below. Use a sharp blade to clean the terminals. A soldering paste and soldering iron. Your common sense is important here. Looking at the power flex. Connect terminal 1 and terminal 5 respectively for the power points. If your the instruction carefully the phone should be on and able to be controlled with the power switch. 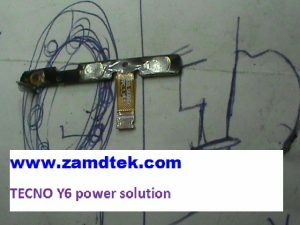 The solution to Tecno Y6 power problem Zamdtek posted here has been tested in our workshop. We don’t take any responsibility whatever if anything go wrong in cause of your own work . We repeat this and loud please do it at your own risk. You can ask us how. Use this guide at your own risk. Zamdtek shall not have any liability or responsibility for whatever happens to you and your device by using the instructions in this guide. but look at the image carefully. a power button is just a switch.